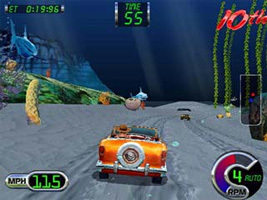 A racing game set in fantasy locations. Race to checkpoints within the time limit, performing stunts to add time to your clock. Pass the finish line before the other racers to win the race. There are 12 courses to play through. Unlock new courses and vehicles by completing set numbers of miles. Play alone or race with up to four players.